You've gotta know that this book piqued my interest, don'tcha? I was offered a chance to review this book thanks to Harper Collins and I said "yes" to it quicker than a wink! Love in a Time of Homeschooling is subtitled, "A Mother and Daughter's Uncommon Year" which made me kinda snicker from the get-go. This book is a memoir written by Laura Brodie who decided to homeschool her eldest daughter, Julia, during her fifth grade year. For one year she wanted to try giving her daughter a more vast - and yet flexible - education. For an interesting plot twist, during this same year her other two daughters would be attending the local public elementary school. Brodie is writing from an interesting perspective. She is a great believer in the importance for mothers and children to have their time away from one another. She doesn't think the public school is doing a very good job educating children. She rather subtly mocks people who homeschool as a way of life, and yet she also makes the statement that some people like to temporarily home school for the sake of giving their child "one good year." I found Love in a Time of Homeschooling to be full of mixed messages when it came to her ultimate opinion of home schooling. On the one hand, I'd say she read a lot of books about How-To Homeschool. She participated in a few group field trips with other homeschoolers in her area. But she based most of her knowledge of what homeschoolers believe or how they function on internet research and a few book titles. Yet clearly Brodie prides herself on being a well-educated woman who knows her stuff. I think she did a truly awesome job homeschooling Julia for a year. Her intentions were fantastic, her creativity and imagination in the task is exemplary and she held her daughter to the task of being educated. For me, as a homeschooler (having been raised as such and now being at home with my own children), I grinned through most of this book. It came across as the typical, "Public schoolers think homeschoolers are W-E-I-R-D" type of read. Even the title suggests her opinion of the trend to school at home - as if this is something that is (or should be?) uncommon. I bet that if she could find a way to strengthen the public school system and eliminate state-wide testing (she really is not a fan of rote testing), she'd be up in arms against the concept of homeschooling. The message that homeschoolers are an odd breed is kind of old and eye-rolling to me. So I had a hard time taking this book seriously -- in part. 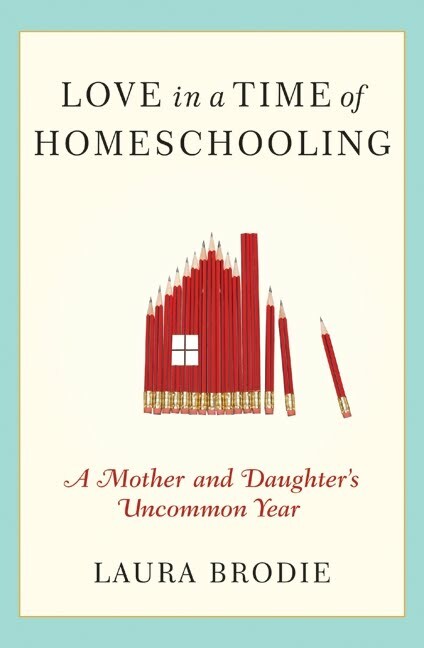 If anything, I think this book shows the thought-processes behind why a parent would choose home schooling, even for a short period of time, for the enrichment of their children. In the end, I think the book makes a positive statement towards home schooling - even unintentionally at times. I quickly devoured this book and was entertained, amused and, at times, mildly frustrated. I'm still not sure what to think of calling this journey "uncommon" since for me (and most, if not all, of my friends growing up!) it was the norm. I suppose the most remarkable thing about the book was in connecting to another person's journey in a way that only a homeschooler could. I could nod in agreement and empathize even with her arguments for not wanting to do it long term. I don't know exactly what our family's own school journey will look in the future - so I'll make no predictions. It's nice, I suppose, to see books like this come out because it just makes what others find a little strange to be less so. That's a benefit that I see much value in and if you are curious about homeschooling, this certainly makes for an intriguing read! Thanks, Harper Collins, for feeding my own personal curiosity and allowing me an opportunity to read this book! For those of you interested in another opinion - Lauren also reviewed this book over at 5 Minutes for Books. Hop on over to see what she thought of it! I am drawn to this title because of the mother-daughter angle. I think it's probably a critical time to be with one's daughter. In fact, a friend of mine has a daughter in 4th grade who was having some social trouble. She begged her mom to homeschool her. She pulled her out at Spring break, and is doing it next year too, with the intention of putting her back in school for middle school. It's been great for them. While I am happy with my kids' public school education (and yes, happy that we do have some "time apart"!! ), I also would love the opportunity to delve down deeper into some areas of interest for my kids and me. I always mean to take advantage of summers etc, but don't. Perhaps this will inspire me?? I saw this book on another blog and thought it looked. . . interesting. Great review! Carrie, I really appreciate your perspective! I admit that I grew up wondering why anyone would homeschool. As a child, I LOVED school (that's one reason I became a teacher), and I couldn't understand why anyone would stay HOME! Of course, things are much different now, and as a parent, I see so many benefits to homeschooling. I am glad that more people are realizing what a great option homeschooling is! Although I am on a different page than the author when it comes to my faith, I am glad that books like these present homeschooling as a reasonable option to those who may be doubters. I think there can be pros and cons to any schooling choice, and every family should have the right to choose what is best for them and the support from those around them! And yes, I taught first grade, third grade and Reading Recovery (an intervention for those falling behind in first grade reading) in the Metro Nashville Public Schools. My kids attend in a county outside Nashville, but I spent 6 years teaching before my son arrived! A great review, Carrie, especially from your perspective of being a homeschooler. I've homeschooled my kids their entire lives, so I'm used to the stereotypes about it all, too. But it sounds like this book would be a good one for me to read to hear yet another perspective. Thanks! Well now. How could I NOT have an opinion on this?! :) My first thought... as a home school mom I often wish for a little more apart time - but I know my time with my kids is limited so I choose to be with them. My other thought (only 2?!) is why only give your child ONE great year? We're headed to DC for a few days soon and my list of places to visit is longer than I have time. It would be a dream come true to live close and take advantage of all those museums!! !